1 Day Trip Nairobi Excursion. Nairobi National Park is located 7 Kilometers south of the City Center. If you fall into the temptation of taking a game drive you will be able to see lions, leopards, giraffes, buffaloes, cheetahs and a diverse birdlife. The park also offers campsites, picnic sites and walking trails. 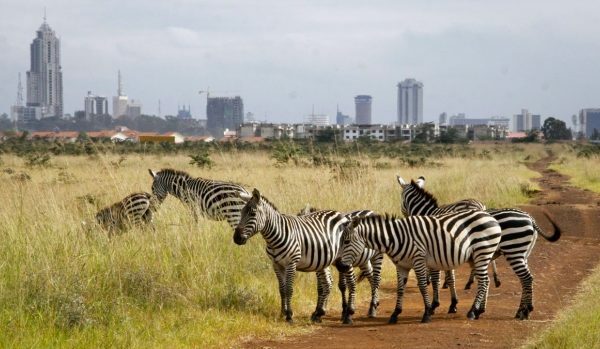 The park fees are Kenya shillings 500 and 300 for residents adult and children respectively and USD. 50 and USD.25 for non-resident adults and children respectively. If you do not have much time to spare or you would like to do as much as you can, visit the Animal Orphanage which is located at the entrance of the Nairobi National Park. 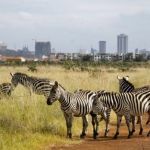 Just next to the Nairobi National Park is the Nairobi Safari Walk. This place is a perfect escape from the city, a cool place to leisurely walk around and chill on a hot day. Animals like colubus monkeys, albino zebras, antelopes, a variety of birds and insect species can be found here. If lucky, one can spot cheetahs, a white rhino and other big cats. The raised wooden boardwalk allows a good view of the animals in the zoo. Remember to carry drinking water and your picnic items with you. This orphanage takes elephants and rhino calves from all over Kenyan National parks who have been orphaned by poaching, and later releases them back to the wild when they are grown. The David Sheldrick Elephant Orphanage is located 30 minutes from the city centre and the donation fee / entrance charge is KES. 500 (approx. USD 5). The time allowed to see the elephants is between 11-12 noon when the keepers bring them to a restricted area to feed, play and be seen by visitors. The guides also teach about caring for the baby elephants and their history since they were adopted. The Nairobi Giraffe Centre is a not-for-profit organization managed by Africa Fund for Endangered Wildlife Kenya Limited (AFEWK) located 20 kilometers from Nairobi Centre, and about half an hour’s drive from Nairobi National Park. Activities include feeding giraffes, learning about giraffes and other wildlife. Across the Giraffe Centre is a small picnic/nature walk site with a variety of plants and birds species. Mamba is a Swahili name for crocodiles. Mamba village is located in Karen area, about 15 kilometres from the city centre and it is typically the third stop for many visitors after the elephant orphanage and Giraffe centre. Mamba village sits on 30 acres with a camp site, accommodation tents , restaurant with party and conference facilities as well as wedding sites. This is home to over 70 Nile crocodile species which range from newborns to adults. The best time to visit is Friday afternoon which is also feeding session for the Mambas. Also in Mamba village is a restaurant with great African decor, and outdoor experience next to the man-made lake. They serve a variety of African continental cuisine. This was initially a farm owned by a Danish author Karen and her Swedish husband Baron Bror Von Blixen Finke. The movie ‘Out of Africa’ was filmed in the farm. In the same compound is Karen Blixen Coffee Garden & Cottages, and Tamambo restaurant for a meal and the authentic Kenyan coffee. Karen Blixen is under the management of Museums of Kenya and opens Monday through to Sundays including public holiday from 0930 am to 18:30 pm. You will get a guided tour around the Museum. The Nairobi National Museum was built in 1929 and is located 10 minutes from the Central Business District, accessible both by public and private means. This is where visitors can learn about Kenya’s history, rich culture as well as contemporary art. They have a variety of dining facilities, a souvenir shop and a botanical garden with a variety of plants and insects. The museum opens everyday 8.30 to 5.30 pm, throughout the year.